A few days before my flight in, Ian had called to say that a friend of his had invited us out and another friend to join him on his fishing boat and go catch some lobster. Would I like to go, he asked? Of course I did! 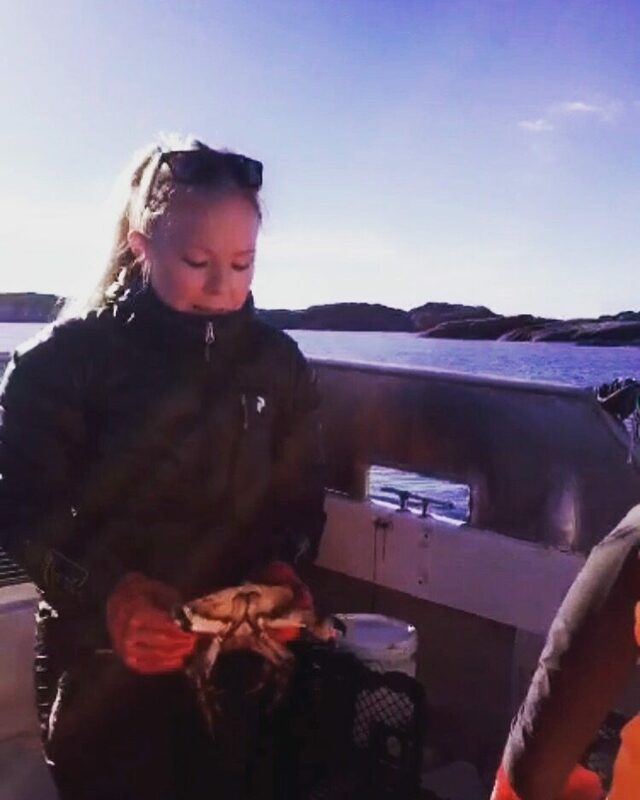 I had been very eager to go fishing since my first trip to Norway, and was very excited about this chance. 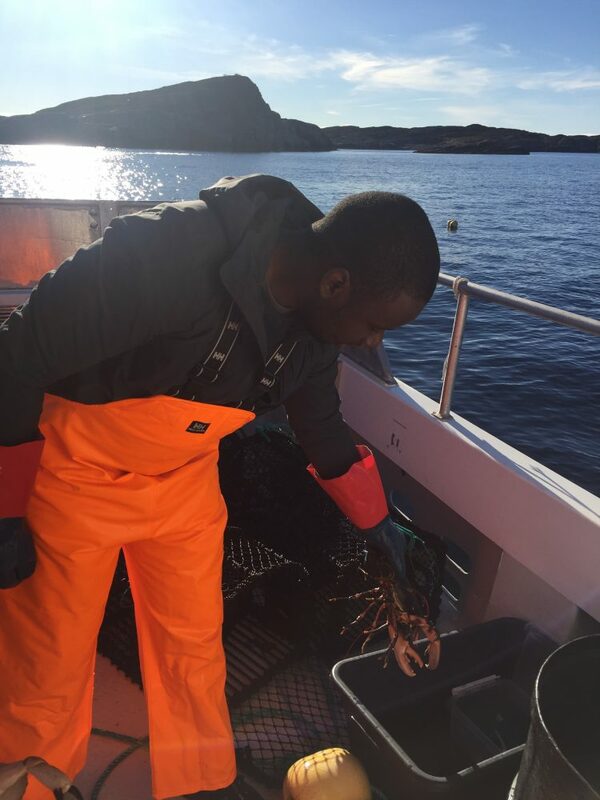 I was happy to go catching lobster! Come the morning of the D-day, I was up early like a proper fisherman. My eagerness soon suffered a low, as I realised that my wardrobe was acutely lacking in the lobster-catching, out-at-sea department. My Scandinavian wardrobe is only just growing you see. Malta and Uganda are very different climates to dress for. Norway dictates I acquire a whole lot of new wardrobe items, or else I’ll turn to ice. Ian and I had discussed seaworthy wardrobe we felt okay about prior, but on the morning of, practicality (and my need for form fitting wardrobe because of my tall height that looks shabby in loose wear) dictated that we go in a different direction. So jeans it was. Fitting for the occasion considering jeans were originally made and meant for mine workers, so why not fishing? Fortunately Kristian, our host and instructor to be, had prepared fisherman’s overalls (in a colour so bright my colour-loving African self rejoiced at the sight) and boots. 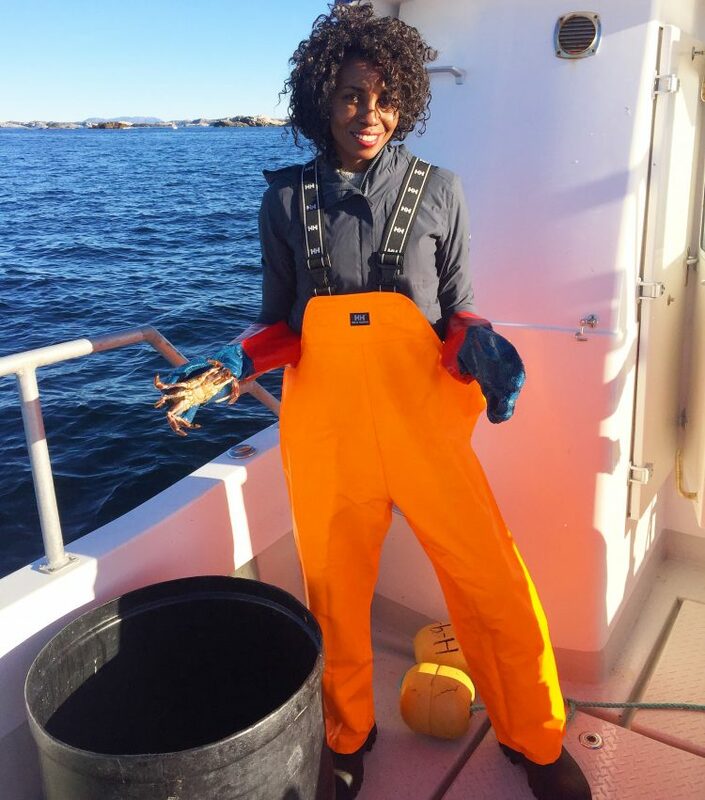 With this uniform on, I was ready for my first day as a lobster catcher. 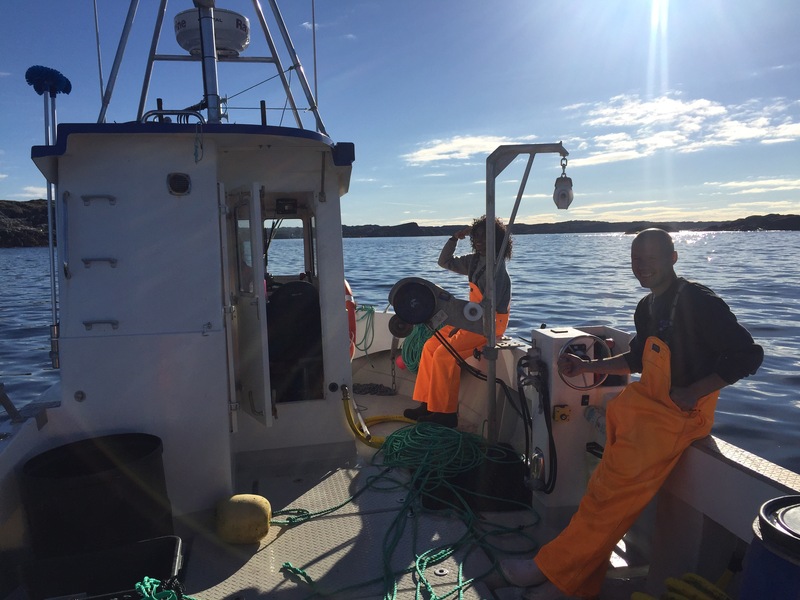 Traps are set with bait and left out at sea attached to buoys in numerous positions. Sometimes a buoy has more than one trap. The number of traps you can leave out is limited by law. So how does catching lobster work? Kristian navigated the boat to the positions where they (himself and his family’s commercial fishing enterprise) set their traps. We reeled in the traps using the pulley, and were very lucky to have a lobster in our very first trap. Most of the catch was crab, we caught lobster in about 2 other traps of the maybe 10 we reeled in. 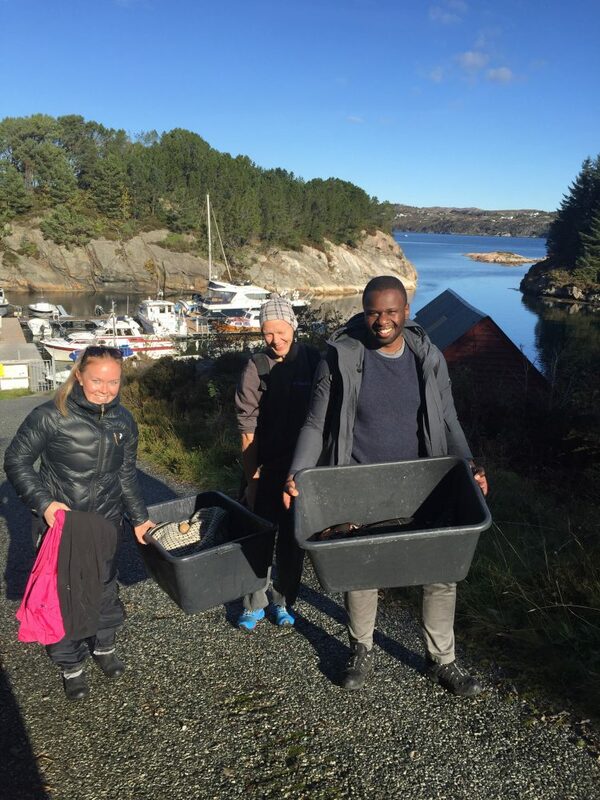 I do, however, have evidence of the rest of our boat duties, Marthe, Kristian, myself and Ian, taking the crab and lobster out of the traps and into a drum. Catching lobster and crab fish is not for the faint hearted. You’ve got to wear protective gloves for this, especially if you’re new at it, lest you get bitten. These things have very strong claws and jaws and could make off with your finger. As we were transferring the lobster to their own container, I asked Kristian if they can leave peaceably with one another. No they can’t, was his answer. To stop them from biting and clawing each other to pieces, the lobster are bound with rubber bands. It was un, exhausting work catching lobster and their less fancy counterparts. The crab. I am not embarrassed to report that I eventually got sea sick. Apparently my sea legs need work too! Overall, the day was a success. 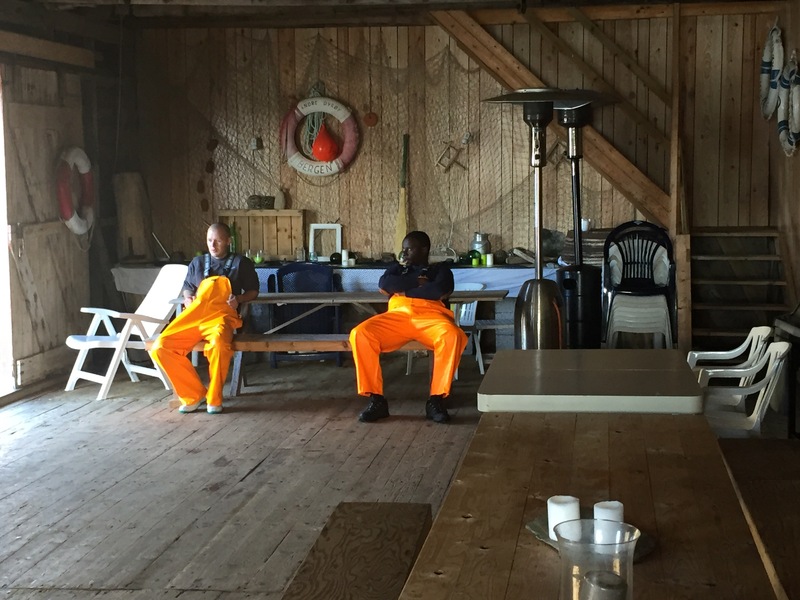 The men rest after the day’s work. 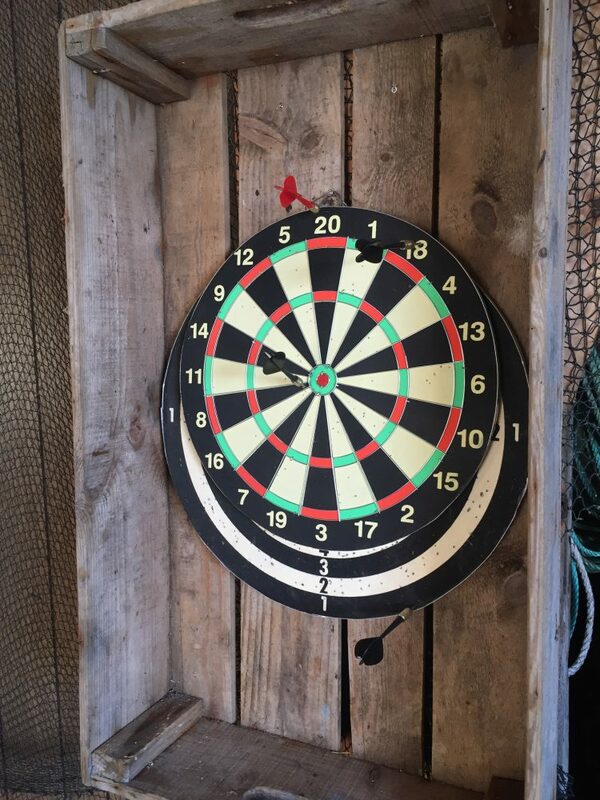 While I try out darts for the first time. Taking the catch uphill to the cars.